A large Victorian Country House satin birch and pine refectory table c1880 with a cleated top on turned and ebonised legs. This wonderful table will seat 10 -12 people in comfort and will make a great table for a large country house kitchen with a thin frieze and plenty of legroom at 24 ins . 111ins wide 41ins deep 29ins high. A matched pair of Edwardian brass Pullman lamps C1910. A matched pair of Edwardian brass Pullman lamps C1910 rewired to modern safety standard with antique bronze double flex. Read more: A matched pair of Edwardian brass Pullman lamps C1910. A small George 111 pine bureau c 1800 . This small bureau at 3ft wide has the original brass swan neck handles and stands on bracket feet . 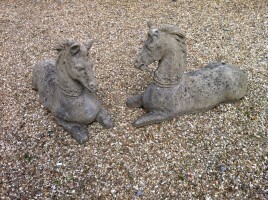 It`s a lovely dry washed out colour and would look perfect in a seaside house or small cottage. 36ins wide 19ins deep 41ins high. 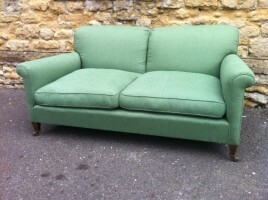 An Edwardian Knole Sofa by Hampton and Sons in the original Green Velvet C1910. This large knole sofa was made by one of the leading London furnishers at the turn of the century and is stamped on the brass castors 'Hampton and Sons, Pall Mall. The drop arms are on a brass ratchet. A small Edwardian mahogany camel back 2 seater sofa c1910 in Georgian style. 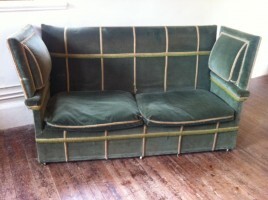 This small sofa retains the original horsehair upholstery and springing in excellent condition beneath the original green linen undercover. 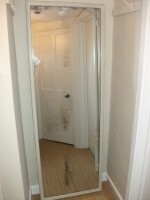 It is a perfect size for a bedroom or small flat and will recover well. 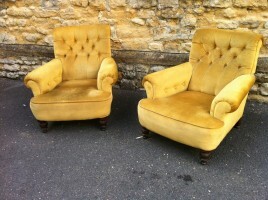 A large pair of Victorian button back library chairs c 1880 on turned mahogany legs. A Edwardian mahogany armchair c1905 for re upholstery on square tapering legs brass cappings and castors. A Chippendale period George 111 mahogany chest of drawers c 1770 with original brass swan neck handles on bracket feet. A late 18 Century oak South Wales potboard dresser C1800. The rack with the original iron hooks , the lower section with an arrangement of five drawers around a central arch on turned columns and a potboard base . This pretty small dresser has an original nutty colour and would be perfect for a small cottage or farm house with a display of traditional or modern ceramics on the rack. An Edwardian silver plated lamp C1910 now rewired with antique double flex silver wire to current safety standard . 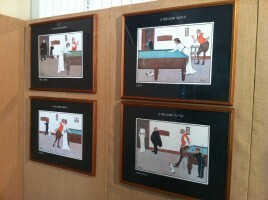 A set of four Edwardian billiard table prints C1910 . A late Regency painted pier mirror c1830. Decoration refreshed. A Victorian rosewood and sycamore marquetry rectangular wall mirror c 1860. This small mirror is ideal for a bedroom or bathroom with its pretty floral marquetry decoration and original mirror plate. Read more: A Victorian rosewood and sycamore marquetry rectangular wall mirror c 1860. A William IV Gothic oak 12 sided leather topped library table the hinged top on a carved arched column on concave and gadrooned quadrapartite base c1835. 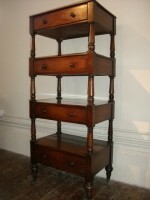 A Victorian honey coloured oak glazed bookcase c1880 with adjustable shelves and panelled back on plinth base. 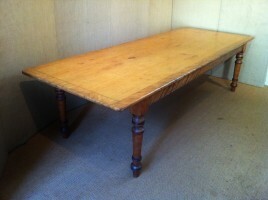 A Victorian pine oak and ash refectory table c1880. A Victorian pine oak and ash refectory table c1880. 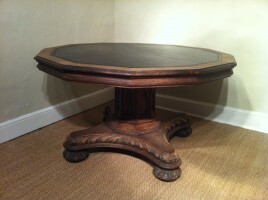 This table has a lovely thin frieze and is easy to sit at for a comfortable 8 people. The top is of oregon pine with the original patination and the base is a mixture of english ash and oak. Read more: A Victorian pine oak and ash refectory table c1880. An unusual small Chippendale period provincial mahogany serving or console table c1770. The frieze is carved with a strong egg and dart mould to the underside of the top with a bead and reel mould below all on square chamfered legs. The top is an old late georgian replacement --originally it probably would have had a white marble top which could be replaced . 45ins wide 17ins deep 29ins high. A late Regency faux bamboo painted box commode or stool c1830.